Troop 471 "In The News"
2019 Merit Badge College Info. Troop 471 Merit Badge Info. 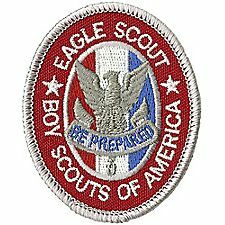 The Eagle Scout Rank is the highest rank attainable in the Boy Scout program of the Boy Scouts of America. Earning the Eagle Scout Rank takes years of hard work. Not every boy who joins a Boy Scout troop earns the Eagle Scout Rank; less than 5 percent of all Boy Scouts do so making earning this award a huge accomplishment. Been an active Boy Scout and troop member for many years. Demonstrated that they live by the principles of the Scout Oath and Scout Law in their daily life. Progressed and earned the Scout, Tenderfoot, Second Class, First Class, Star and Life Rank awards. Earned a minimum of 21 Merit Badges including 13 required merit badges teaching Scouts Citizenship and skills in First Aid, Communication, Cooking, Camping, Personal Fitness, Swimming, Lifesaving, Emergency Preparedness, Personal Management and Family Life. Completed a minimum of 18 hours working on service projects. Served a minimum of 16 months in a leadership position within the troop. Proposed, planned and carried out an Eagle service project. Had seven Scoutmaster conferences and six boards of review.